Our family squeezed in one last trip to Moab this past weekend. The weather wasn’t perfect but the company was great. 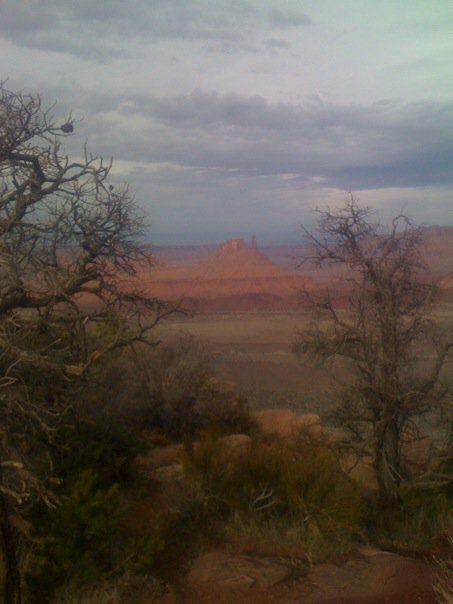 Despite 30 mph winds on Saturday, both Ian and I enjoyed rides on Flat Pass and Porcupine Rim. The trails were still very rideable with only very small patches of snow on Porcupine Rim. I know I should be training for the upcoming ski mountaineering race at Irwin Lodge but it was really nice to get one more mountain bike ride in before winter is here to stay. After a lull in the wind late on Saturday evening I thought we’d be set for a calm morning on Sunday. Nope, I was wrong. The wind picked up right where it left off on Saturday so I ventured up a dirt road close to the condo (thank you Degenhardts!) to do a little exploring while running. I made it to a nice overlook but need to get back another time to put in some more miles of checking out the area. We returned home to winter with the ‘big blizzard’ dumping a whole two inches in Carbondale. Aspen opens this week so it is officially time to get on my skis and start training for the next racing season. Maybe, just maybe, I’ll motivate to get out of bed early tomorrow and train before Ian heads off to work.